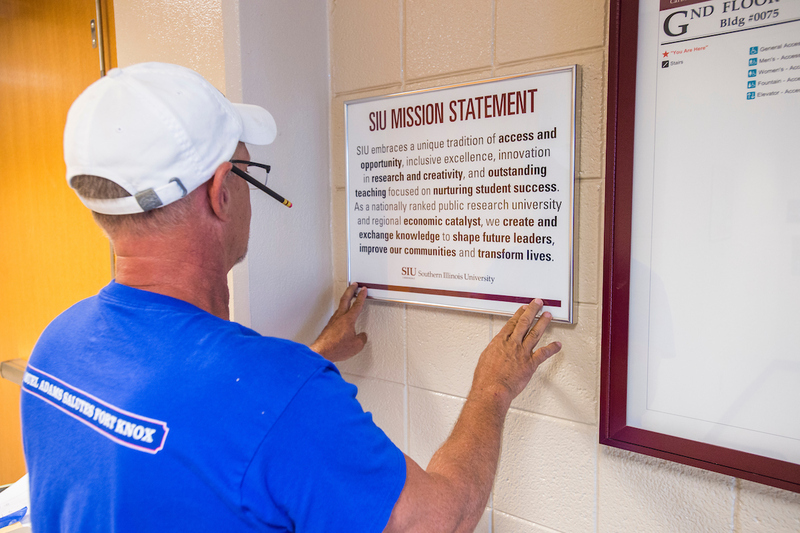 Visitors to campus — and those of us who are here every day — may notice framed versions of the mission statement popping up inside entrances to our academic and office buildings. These serve as a friendly reminder of our core values, our purpose — of what we are here to do. The mission statement speaks to our commitment to our students and region, of the importance of research and creativity, and of our commitment to inclusive excellence and the creation of new knowledge. As I’ve written before in this blog, we are accomplishing our mission in many ways. It doesn’t hurt to make sure that the expression of our mission — our mission statement — is always before us as we go about our business. It should influence every decision we make and how we talk about ourselves as an institution. As the academic year gets underway, you’ll see other reminders of our mission with the installation of new banners in parts of campus. The banners highlight some of the concepts of our mission statement in pictures or words. I also hope they help us take even more pride in our beautiful campus. The mission statement must be our touchpoint when we reflect on our core values: supporting student success through experiential learning, ensuring that every graduate is emotionally intelligent and culturally competent, developing knowledge that addresses real issues, and serving as an economic driver and partner within our community. Every action we take must be put within the context of our mission. That’s worth remembering, every day.